In either class the need for big budgets is not necessary as the cars are very affordable to buy/ build and have a proven reliability which vastly reduces the maintenance costs during a season. Class A is specifically designed to be a great introduction to motorsport for new drivers. Drivers have used this affordable opportunity to learn the skills necessary and to develop a media platform, important in attracting the necessary funds to continue or progress through the ranks if they wanted to. 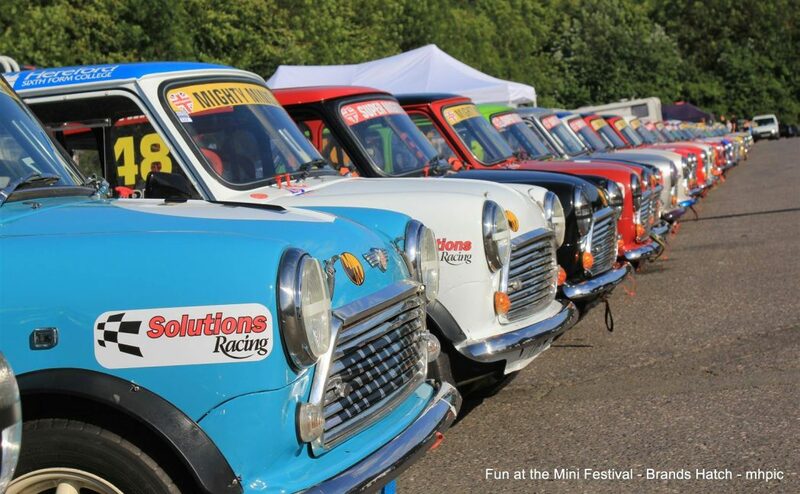 The cars for the Class ‘A’ cars are 1275cc and Class ‘B’ are 1293cc Minis that adhere to the technical regulations designed by Mighty Minis racing. In essence they are Mini Cooper power units. It is very easy to upgrade/change any post 1976 Mini model to be eligible to compete in either of those championship classes. For the 2019 season there will be a new opportunity for carburetor fueled cars, these can be built up from any post 1976 Mini saloon shell including the clubman. The engine and gearbox specification, suspension etc are as per the Class A or Class B cars. We believe that the accessibility of parts is far easier to build a carburetor fueled car resulting in a very affordable way of enjoying Mini circuit racing. The tyres for the Class A are Yokohama A539 and the front suspension is fully adjustable non rose jointed, whilst the rear has adjustable negative camber and caster plates. The shock absorbers are GAZ adjustable lowered all round. The rear and side windows are polycarbonate and the front screen is mandatory laminated version. All cars must be fitted with the control Safety Devices 6 point roll cage. All other safety equipment is per the MSA yearbook. Class B – Super Mighty Minis offers a slightly enhanced technical challenge and assists driver’s in honing their race-craft, but still adhere to the original concept of affordable competitive motorsport. The Super Mighty Minis have a control cylinder head, which is mandatory. The engines are re-bored to 1293 cc and use the Omega pistons, control camshaft. The drop gears are straight-cut with a fixed ratio, as are the gear cluster, lay gears and differential gears. The differential unit is a cross pin-unit. The tyres are Yokohama 048R and the front suspension is fully adjustable rose jointed, whilst the rear has adjustable negative camber and caster plates and a control antiroll bar. The shock absorbers are the GAZ lowered adjustable bump and rebound units. These engines can be fuel injected or carburetor fueled.